Mumbai: Tagged as the lifeline of Bollywood by none other than the ruling Queen of the Tinsel Town, Kareena Kapoor, Salman Khan is known for his faith in secularism. So, today when devotees of Lord Shiva from across the globe observe Maha Shivaratri, Salman plans to spend this auspicious day at his farmhouse. From a reliable source of an entertainment channel, it has emerged that after returning from Cuba, where Salman was shooting with Katrina Kaif for ‘Ek Tha Tiger’, the actor will head straight to his farmhouse to celebrate Maha Shivratri and recuperate before starting his next film. News has it that Salman has organised a huge feast in his farm house. The actor will be celebrating the festival with his family and the 125 villagers staying near his farm house. Salim Khan, Salman’s father reached the farm on Saturday and is doing all the preparations for Shiv Pooja. The celebration will be joined by the actor’s brothers Arbaaz and Sohail Khan. Also, the farmhouse has a Shiva Shrine and they have appointed a pujari to do the rituals. Salman will be fasting for the day and the family will break it together later in the day, it as they do during the month of Ramzan. Reportedly, Salman was troubled by a nerve problem for which he had to go for a surgery last year in the US. And according to sources, Salman has painted a series of paintings on Hindu Gods like Shiva, Kali and others from his own perspective. 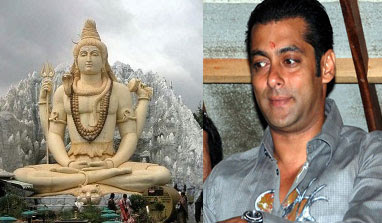 We pray and hope Lord Shiva rids Salman off his illness.